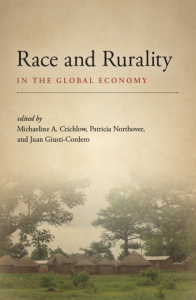 Based on a 2014 conference co-hosted by the Kenan Institute for Ethics, Michaeline A. Crichlow, professor of African and African American Studies and Sociology at Duke and a Senior Fellow at the KIE, has co-edited a volume of essays examining globalization’s effects on the interplay of race and rurality as it occurs across diverse geographies and peoples. Race and Rurality in the Global Economy suggests that our current fractious state of global politics begs for closer attention to be paid to the deep-rooted conditions and outcomes of globalization and development. Essays in the book, due out in October 2018 from SUNY Press, examine how issues of migration, environment, rurality, and the visceral “politics of place” and “space” have been the focus of recent political struggles in the United States and Europe and have been suffused by an antiglobalization discourse that has come to resonate with Euro-American peoples.